All good planning- whether it be a building, village, town or city – needs to be designed with P.L.A.C.E.S. 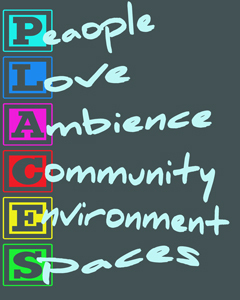 (PLACES) in mind, that is: People, Love, Ambience, Community, Environment, and Spaces. People – design around people’s needs. Love – what do we love, what makes our spirits soar? Ambience – consider the character and atmosphere of a place. Community – the design should connect the community and involve the community. Environment – there is a need to tread lightly on this world, therefore good design and planning will be ecologically friendly and consider the environment. Spaces – create a sense of space – places where you want to be – shared and kept simple. Is easy to move around, makes us happy, healthy and stress-less. The priorities should be walking, cycling, and us of public transport. And lastly the car. Designed for People. Allows us to live the life we love – connecting with nature, family and friends. Designed for Love. Makes us feel good. With beautiful views, vistas, light and structure. Plus a sense of privacy and sometimes a sense of delight or even awe. Designed for Ambience. Creates a connection to our local community. Provides gathering spaces and walkable links to local shops, gardens, beaches, schools, etc. Designed for Community. Considers the natural environment. Provides wildlife corridors and as much green spaces as possible (consider green roofs and walls, or garden roofs). But designs should be ecologically friendly too, here in the southern-hemisphere we should have windows with eves facing north. Homes should be small with shared spaces. And we should use natural sources of heating, cooling and power. Designed for the Environment. Provides spaces people want to go to. Share spaces wherever possible – a market place could be used for gathering picnic places after the market has gone, a playing-field as a park. Spaces need to be attractive and have a sense of purpose. Designed to create Spaces. ← Maybe tiny is the answer?